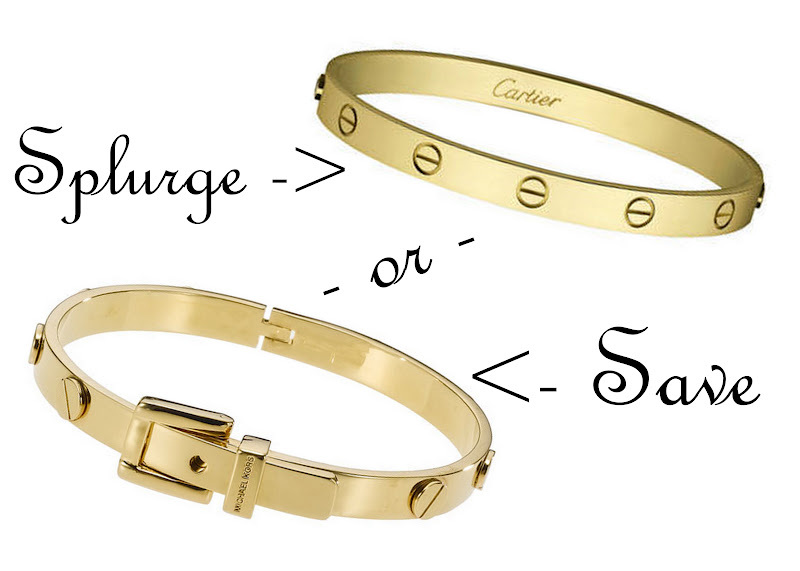 I've been in love with the Cartier Love bangle for sooooo long. I often put it out of my head, it's such a luxury item & nothing I ever thought I'd get. But them in my Blogger Gift Guide Miss Alex, chose it as her lust gift from her Man (Who could argue with her?!) and then all over my trashy TV shows (insert *shame* Kardashian's in NY, Kourtney wears two constantly). Needless to say, I now have a radar for them. I spot them everywhere. On a lady while out shopping. In an ad. Random photos, everywhere! Then I saw this....Save version. It is not the same. But so close. And fun?! Is it ok to get a space saver to tide me over???? Would you Splurge or Save? Would LOVE a Cartier bracelet but I doubt itll ever happen! i say get the kors bracelet now while you wait for the real thing. i want one, too, but the price keeps going up since the price of gold is on the rise. they are so iconic and timeless. love! Ohh I love this story, and this save + splurge! But I need the splurge. I am seriously so obsessed... I need the splurge. Do you know that 2 years ago they were $3200 and now they are $5500. I mean ridiculous. Great replacement but there is still just something about the Cartier version that is worth the splurge! I always wondered what the story was behind the Cartier bracelet! Thank you for sharing! I say splurge... You might as well because you'll have it forever! Haha. I loved this. Before I was lucky enough to be given one of these by my boyfriend, I had the CC Skye spike bracelet which is similar too. Loved the story! SPLURGE please! Maybe our hubs' can get a 2fer deal?! I adore the splurge -- so pretty! I'd go with the save, and take that leftover $31,615 to plan a vacation in Europe.